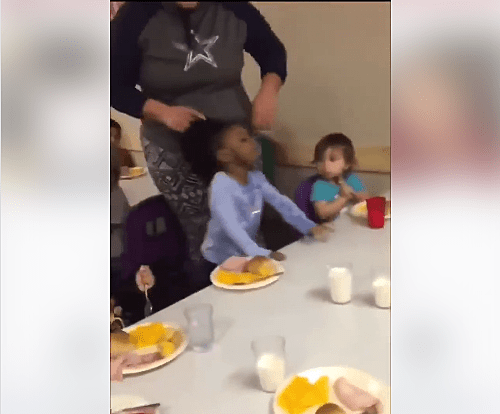 LUBBOCK, Texas – Video shows a Day care worker in Lubbock, Texas pull on a black child’s hair while another films and laughs. ‘My Little Playhouse’ daycare in the 3600 block of 50th Street is under fire after a viral video on social media showing an adult pulling a child’s hair. The daycare employee was telling the child to eat and pulled her hair. Another woman recording could be heard laughing. Other children seemed to be eating nearby. Playhouse Learning Center LLC were made aware of video footage posted on social media at approximately 11:45 a.m. Staff involved were fired immediately. Local authorities (LPD) has been notified and are investigating accordingly. Texas Department of Childcare Licensing has also been notified.